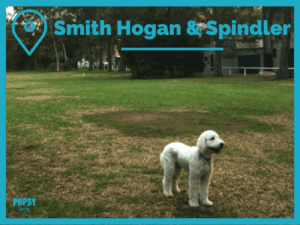 Glebe Foreshore is a stunningly beautiful dog walking area with multiple parks and viewing points towards the Anzac Bridge and Rozelle Bay. 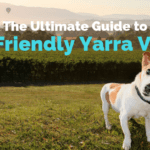 It is one of the best dog walking areas only a few minutes away from the CBD. If you arrive by car, you can park at the parking area on Chapman Road right next to the Federal Park. PetO is conveniently located opposite the car park in case you needed to get a ball or some treats for your walk. Game on at the off lead area in Bicentennial Park! 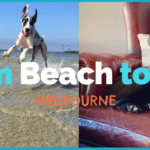 Start your journey by releasing some of your pup’s excitement with a little play at the Federal Park or Bicentennial Park off the lead areas. If the weather allows, your dog has even access for a quick swim at the edge of the Bicentennial Park. Although the park sometimes gets busy, it is large enough not to feel too crowded. Bicentennial Park was established in 1988 to commemorate 200 years of white settlement in NSW. 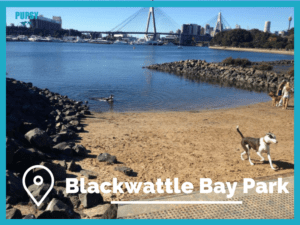 Once your furry friend is ready, start your walk towards the Blackwattle Bay along the Rozelle Bay shoreline. 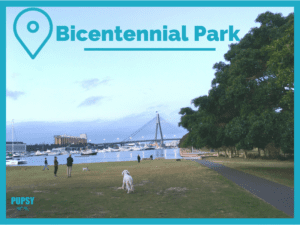 This is an easy and picturesque walk, however remember to leash your dog when crossing to the eastern side of the Bicentennial Park. 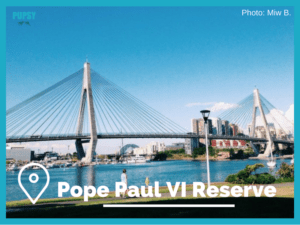 Right after the Jubilee Park you will arrive to the Pope Paul VI Reserve, established to commemorate the first ever papal visit in 1970. Slow down, relax and enjoy the unique viewing point over the three iconic bridges: Anzac Bridge, Glebe Island Bridge and the Harbour Bridge. From this point onwards your dog can roam freely off the lead all the way up to the Sydney University Women’s Rowing Club. Great dog beach at Blackwattle Bay! TIME FOR A QUICK DIP @ BLACKWATTLE BAY! 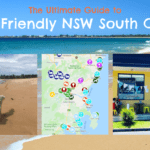 Blackwatttle Bay Park is another great off the lead area where your dog can meet new friends for a tail wagging play. You may decide to turn back or continue a little further to the Wentworth Park off the lead area, located north of the Greyhound Stadium. If you feel super energetic, you could even walk across the Anzac Bridge and come around the entire Rozelle Bay, which would take you approximately 2h altogether. Alternatively, you can return through the small streets in Glebe to admire all the Victorian homes and Federation houses. On your return to the Federal Park have a quick look at the Tramsheds located between Dalgal Way and Maxwell Road. 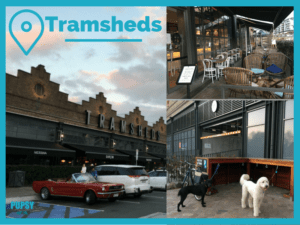 Unfortunately your dog is not allowed inside but there is a rather cute dog parking station just outside the Tramshed in case you want to have a quick peak or pick some delicious treats or maybe a bottle of artisan wine. Some of the cafes have outdoor seating areas for both you and your dog to enjoy the coffee together. Or simply reward yourself with an ice cream from Messina! 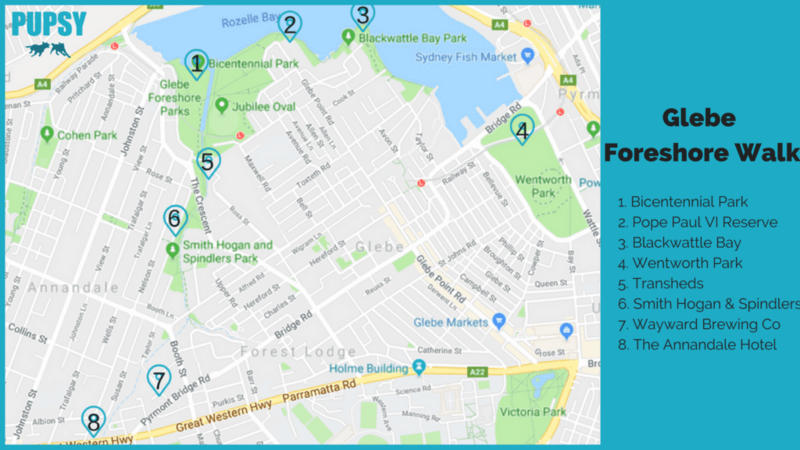 From here you can either return to your car or continue your walk along the Johnstons Creek through Smith Hogan & Spindlers Park towards Annandale. Most of the park is off lead except the end of the park (area is well signed so just follow the signs). You can return on the cute little walk path on the other side of the canal. TIME FOR A WELL DESERVED DRINK! By now you must be ready for some refreshments! 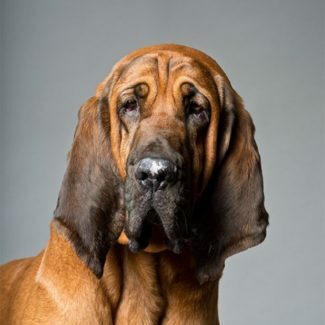 There are two excellent dog friendly venues nearby where your dog is allowed inside the main bar with you. 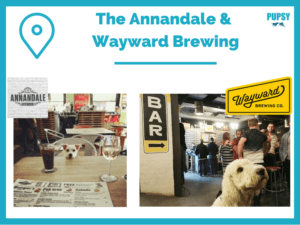 Our Venue of the Month Wayward Brewing is an easy 15mins walk from the Tramshed and offers a unique brewery experience for both you and your dog. Or you can drop by at the iconic The Annandale Hotel located 20mins walk from Tramshed on the corner of Parramatta Road and Nelson Street. Normally you can find a parking spot relatively near both of the venues in case you wanted to drive a little closer. Let the tail wagging adventure begin! 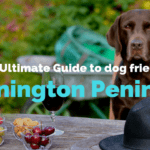 Discover other dog friendly places on Pupsy!